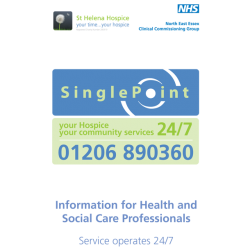 SinglePoint is a 24/7 advice and coordination service for all palliative and end of life patients, carers and professionals within North East Essex. As well as providing access to all hospice services it coordinates the local Marie Curie night nursing service and liaises with the specialist palliative care hospital team, community nursing, GP, ambulance and out of hours services. It includes ‘My Care Choices’, an electronic register of patients identified by GPs as being in the last year of life, making their care preferences accessible by all relevant agencies. It also provides a rapid response service to help prevent avoidable hospital admissions. The service is based on a single phone number given to all palliative and end of life patients and their carers. Palliative and end of life (EoL) care in North East Essex is provided by agencies and support, particularly out of hours, is unreliable. Mortality rates at Colchester Hospital were high and few patients died in their place of choice. Patients and carers said that having a single point of contact would improve their experience. St Helena Hospice already provided an advisory service for patients, so was ideally placed to propose plans for expanded service covering NE Essex. The proposal was presented to the local commissioning group as a partnership approach, funded jointly by commissioners and the Hospice. All calls would be answered by clinical staff able to organise immediate, appropriate, help. In its first six months the service dealt with 13,000 calls. The project had seven main objectives. First, to simplify access to palliative care advice, guidance and support, 24 hours a day, seven days a week. Secondly, to enable patients to continue to be cared for in their place of preference. The project also committed to reducing the number of avoidable admissions to hospital, and to improve the availability of specialist palliative support to healthcare professionals. 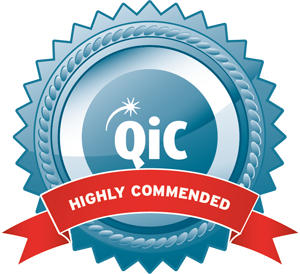 Further objectives included coordinating, on the patients’ behalf, the services provided by care agencies, and improving the quality of palliative and EoL care for all patients in NE Essex. The final objective was to ensure that the improvements are sustainable.